Finally, the New Yorkers are finished with their first-round play and the Padres and Cardinals will play a night game! Including the regular season finales for both teams, San Diego and St. Louis had played four straight day games over seven days. Before you pull out the air violins and play them a facetious little tune, consider that the difference for players is not just adjusting their body clocks six or seven hours earlier. Day games are usually great for pitchers and terrible for hitters, as shadows creep across the field leaving home plate in the dark and the mound in the sun. We’ll see what kind of effect that has particularly on Cards starter Chris Carpenter, who dominated the Padres in Game 1 by pounding curveball after curveball through the shadows and into the dirt. What is it about the top of the fourth inning? The Padres broke through for three runs in that frame in Game 3 and held on for a 3-1 win over the Cardinals, forcing another game at Busch Stadium on Sunday. Eight of the 12 runs scored by both teams in this series have scored in the top of the fourth. It’s been a tough few days for home fans, first at PETCO Park and now at Busch. But as usual the Cardinals fans were out in force, lending a college football atmosphere befitting a cool Saturday afternoon in October. Judging from the old-school Onyx blasting from the speakers, the outdoor patio at Mike Shannon’s place a block from the stadium (if we’re throwing out downtown recommendations, don’t forget Charlie Gitto’s) was already getting going at 9:30 a.m., and by the time Jeff Suppan threw his first pitch Busch Stadium was packed. But for whatever reason, the amped-up home crowds have not translated to on-field success for the home team. The Cards will try to reverse that trend tomorrow. The view from the press box on April 10, when the Cardinals played the regular-season opener at new Busch Stadium against the Brewers. St. Louis won, 6-4. Back in St. Louis, where on one hand, the Padres and Cardinals enjoyed a change of scenery Friday, when they worked out at the new Busch Stadium in preparation for Saturday’s Game 3. But on the other hand, it didn’t feel very different at all. 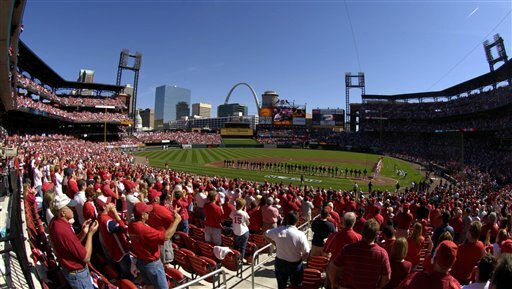 The teams played a three-game series here in the final week of the regular season, with the Cardinals winning the series finale to snap a seven-game losing streak and avoid a three-game sweep. And is it just me, or does the new Busch have a decidedly "old Busch" feel, at least in terms of the layout of the field and the view from home plate? Besides the more open-air feel and the spectacular view of the Arch, I’ve heard a lot of people say the ballpark architects did a good job of preserving some of the "feel" of the old stadium. The sea of red t-shirts and jackets certainly helps, too. Felt like a rat in a maze after today’s game, trying to weave my way against the stream of fans heading for the exits so I could pop into the postgame interview room. After listening to Albert Pujols explain how he hit and ran the Cardinals to another win, I headed down to the service tunnel and found myself stuck in another throng. This one had some familiar faces. Among the several hundred people gathered in the tunnel between the two clubhouses were Marcus Giles, he of the Atlanta Braves and the younger brother of Padres outfielder Brian. A few feet away was Jered Weaver, the Los Angeles Angels of Anaheim pitcher whose hair is about as long as his team’s name. His brother, Jeff, had just pitched five shutout innings in the Cardinals huge Game 2 win. Jeff, whose offseason residence is in Manhattan Beach, Calif., just south of Los Angeles, told reporters a few days earlier that a few family and friends would be making the short trip down to San Diego for his start. He was glad the game was mid-week; it cut down on the amount of people heading down and allowed Jeff to focus on baseball. Looks like he did just that. Edit: Seventh inning and they’re still up there, hanging "K" signs for each strikeout by a Padres pitcher. Cla Meredith just whiffed Jim Edmonds, and a "K" went up for the first time since David Wells struck out a pair in the top of the third. After three days in sunny San Diego, you can’t help but feel like a little kid tugging on dad’s shirt and whining, "Pay attention to me!!!" The Padres have finished batting practice and the Cardinals are on the field, and once again it feels like a regular season game. The press box is a bit more full, but there are no throngs of reporters on the field and I’ve yet to see one camera guy push and shove to get that crucial David Eckstein close-up. A few fans have filtered in, many of them in Cardinal red t-shirts that blend in with the security crew here at PETCO Park. I suppose this is a good thing, because I’m guessing the atmosphere was a bit more frantic yesterday in New York, where the Mets beat the Dodgers thanks to one of the weirder plays in playoff history, and the Yankees and Tigers waited out the rain. Thanks to Torii Hunter’s, "I got it! I got it! I got it! Where’d it go?" play in the Twins’ loss to the A’s Wednesday, even that mid-market series seems to be getting more attention. Oh well. Maybe someone will do something wild in Game 2 in San Diego to put this series on the map. I’m thinking an Eckstein 500-foot homer or a Russell Branyan inside-the-parker will do the trick. I’m sorry, I just don’t buy this notion that the Padres should just throw up four fingers every time Albert Pujols comes to the plate. There is little doubt he is one of the — most would say the — most dangerous hitters in baseball, but that does not mean you should just give in. It was the fourth inning. The Cardinals had a runner on first, there were no outs and Padres starter Jake Peavy had been razor-sharp. Pujols may be "not human," as Peavy said the day before, but he still made an out in more than 56 percent of his at-bats during the regular season. He makes it look easy sometimes, but hitting is actually really hard. The guy hitting behind him is no slug. Jim Edmonds is coming back from a head injury and has been dealing with a foot injury, but is the career NLDS slugging percentage leader. Scott Rolen is not terrible, either. Did I mention it was the FOURTH inning? Are there stat guys out there who can back me up on this? Padres manager Bruce Bochy was tied for fifth in the NL with 63 intentional walks during the regular season and says he is going to let the game dictate the Padres’ approach to Pujols, and that’s the right way to go. Seventh inning, runner on second, two outs, go ahead and walk him. But playing scared and walking the guy every time he steps to the plate doesn’t make much sense to me. Thought it was pretty interesting to read up on yesterday’s Cardinals-Padres Game 1 and see the different interpretations of Padres starter Jake Peavy’s postgame comments. He danced around a few questions about catcher Mike Piazza’s botched pop-up, which may have been the key defensive play of the game because it extended an at-bat for Albert Pujols to crush a go-ahead home run. From video of the press conference, here is exactly what Peavy said when directly asked about that play, minus a dozen or so "ahhs" and "ums:"
"I mean, obviously I needed it to get made. Just a pop-up behind the? Obviously, those are not the easiest plays to make, you know. But obviously it was a big play because it didn’t get made and two pitches later the guy hits, you know, a 500-foot home run to go up, 2-0. It was a big play. It was tough play, no doubt about it, but, you know, like I said, we didn’t make any breaks for ourselves." "’Obviously, I need it to get made,’ said Peavy, when first asked about it. ‘Just a popup.’ But then he said, ‘I mean, obviously those are not the easiest plays to make, you know.’"
"’Obviously it was a big play, because it didn’t get made and [five] pitches later the guy hits a 500-foot home run to put them up, 2-0,’" Peavy said. ‘It was a big play, a tough play, no doubt about it.’"
"’Obviously, that’s a play that needed to get made,’ Peavy said of the foul popup that dropped untouched but was not ruled an error. ‘I know those are not the easiest plays to make, but it was a big play. It didn’t get made and a few pitches later the guy hits a 500-foot home run.’"
It strikes me that "I need it to get made," is a completely different thing than, "That’s a play that needed to get made." Am I just splitting hairs here? I wonder if Peavy and Piazza will have to talk this one out before Game 2. Also, I wanted to point out that we apparently have a definitive answer on whether Pujols’ foul pop hit the netting behind the plate before Piazza tried to make a play on it. Replays appeared to show that it did, but the guy who matters most said it did not. ?It did not touch the net,? home plate umpire Gerry Davis told the San Diego Union-Tribune. ?The ball was in play.? Going into Game 1, no one would say it was a must-win, but everyone felt like it was. Especially for the Cardinals, who do not have the pitching options that the Padres possess and needed to get the most out of ace Chris Carpenter. He delivered, pitching into the seventh inning and benefiting from a balanced attack for a 5-1 Cardinals win. Spent some time after the game with Cards center fielder Jim Edmonds, who has surprisingly good career numbers against Padres Game 2 starter David Wells despite overall struggles against left-handers. Edmonds suffered through post-concussion syndrome in August and September, and there were questions about how badly the guy wanted to get back on the field. Corey Koskie faced the same questions in Milwaukee, where I toil away the summer for MLB.com, and watching him struggle with it was almost painful. It was like talking to a different person — he called the feeling in his head "fogginess," and as he squinted while listening to questions you could tell exactly what he meant. The Brewers basically told him to go home, don’t watch TV, don’t read, don’t do anything but rest your brain. Koskie’s kids drove him crazy, wondering why dad wouldn’t come outside and play with them. You could tell it ate the guy up inside. That said, it’s good to see Edmonds on the field. Whether you’re a Cardinals fan, a Padres fan or just a baseball fan, you hate to see a guy get "hurt" to the degree that it affects his everyday life. He’s a bit questionable for Game 2 after diving in center field during the eighth inning, and he also has an injured toe. His presence is certainly a big boost to St. Louis’ hopes for a 2-0 series lead. 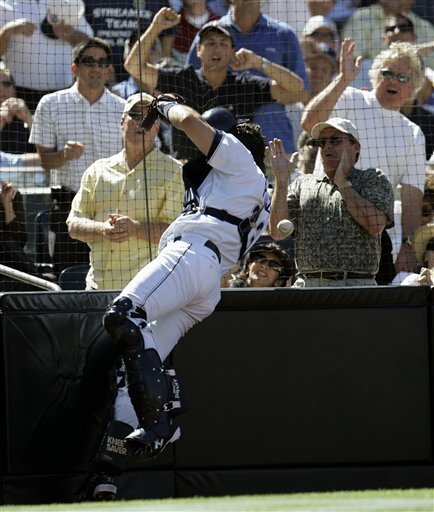 The thick air here at PETCO Park is where fly balls go to die. Scott Rolen popped out to second base in the second inning and it looked like he was hitting a bowling ball. Ditto for Mike Piazza in the bottom of the inning. It made Albert Pujols’ go-ahead, two-run home run in the fourth inning — the first blow by eiher team in this series — all the more amazing. Pujols crushed it, just like he crushed 49 homers in another MVP-caliber season. From the press box at PECTO it looked like Padres catcher Piazza missed a chance to retire Pujols five pitches earlier on a pop-up behind home plate, but the consensus here from replays is that the ball hit the netting before glancing off Piazza’s glove. Peavy fell into a 3-0 hole in that inning and is facing another leadoff baserunner in the fifth as his pitch count reaches 70 and Pujols looms again.